IMAGINE LIVING HERE Welcome home to this spectacular Oviedo home in the highly sought after Carillon subdivision! 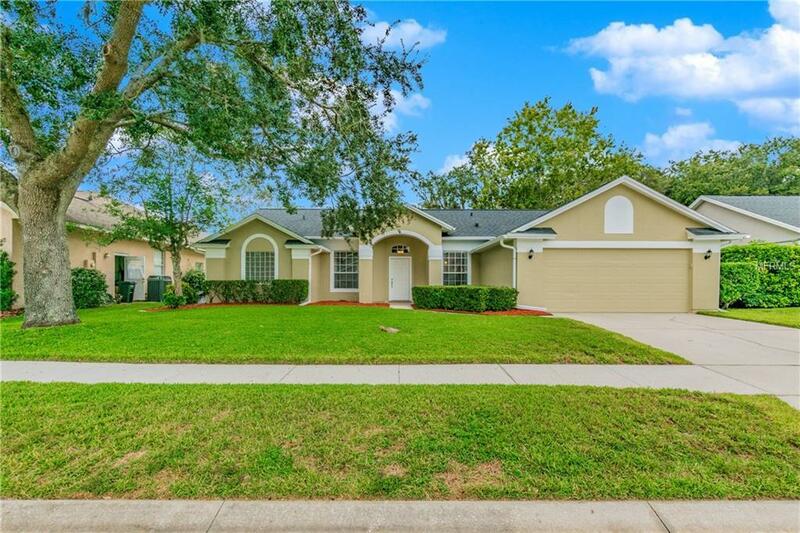 This home is located on a quiet street within the Heronwood section and a short drive from Hagerty High and Carillon Elementary Schools and the community amenities including tennis courts, playground, beach volleyball court, park, and dock. With manicured grass, a mature oak tree out front, and a FRESHLY PAINTED EXTERIOR, the home has a lot to offer in curb appeal. As you step inside the front door, first take notice of the soaring vaulted ceilings and the dark HARDWOOD FLOORS throughout most of the main living areas. The formal dining and living rooms on each side of the foyer greet you at the front of the home. Just beyond a partition is the OPEN-CONCEPT kitchen, featuring stainless steel appliances, a closet pantry, breakfast nook, and breakfast bar overlooking the family room. Lots of natural light sprawls into the family room from the sliding glass door to the screen-enclosed porch. Its the perfect place to enjoy your morning coffee, barbeque for your friends, or watch the kids play in the backyard. The master bedroom also has access to the back porch and the en-suite bathroom features a garden bathtub, private toilet room, step-in shower, and dual sinks on an extended vanity. This SPLIT-BEDROOM floorplan has the secondary bedrooms and guest bath on the other side of the house along with the indoor laundry room and 2-car garage. Updated systems Roof 11, AC 12. Dont miss your chance!